jemstoneblog | Real Stories. Real People. Random Notions. Hello reader! How’s your day going? I hope I’m about to make it better. Before you read this post, it is highly advisable you read the first part here. Enjoy! “Seeeeuuun! Segggguuunn! Seeeeyiii! Shoooogo! ”. The four boys were rudely yanked from dreamland by the sound of their mother’s loud voice as it reverberated throughout the whole of No. 33 Adefila Street. Seun’s eyes lazily drifted to the wall clock. 6:24. Haba! Today was Saturday, the only day of the week they were allowed to be in bed till 8:00am. He looked at his brothers, they were no longer asleep, neither were they fully awake. They were waiting for somebody to get up first. Seun grumbled under his breath. Shet! Seyi thought. It took all of his will power to stay calm. “See them looking at me like basket of tomatoes. Da mi lohun jare!” They all looked at each other confused and shook their heads. “Nobody abi? Ehh hen. So it was a ghost that entered my house, turned up the lantern to highest,” she pointed to the lantern now darkened with thick soot, “and now carried it from the left side of the entrance to the right, abi?” Her tone going up one tone as she said ‘abi’. Seyi gave himself a mental knock. In his hurry, he’d forgotten to turn down the lantern knob. Stupid mistake. He would never steal at night again. He continued to act as confused as his brothers. She ignored their pleas and continued speaking, “Not only is this person lying , this person also stole. The ponmo in my pot is now twelve instead of thirteen, abi you think I won’t know ni? Ehn?” She glared at Segun, the usual culprit. “Yeeehh, mummy, I swear to God Almighty. Emi ko.” Segun said touching the tip of his tongue with his finger and pointing to the ceiling. Shogo stood still unsure of the most appropriate course of action, to join his brothers or to bring the cane as his mother asked. “Go and bring the pankere for me, my friend!” His mother shouted. He scampered away “And don’t disturb your father.” She called after him. She turned to face the others. Shogo returned with “Mr Bulala”, a one feet long cane as thick as a thumb. At the sight of it, Seyi began to tremble. Regret filled his heart. He considered confessing. He looked at his brothers. Segun was already crying. Obinrin. Small cane you cannot chop. He couldn’t blame him though His mother looked like she was ready to flog the life out of them. If none of them owned up she would punish all of them. He knew it didn’t matter at the end of the day, confess or don’t confess he would be beaten. His conscience however would not let him be. Your brothers are innocent, don’t let them pay for your sins. Do the right thing. Remember what they taught you in Sunday school. His mother’s voice jolted him. “Seyi, do you have something to tell mummy?” She asked, eyebrows raised. Voices began warring in his head. Just confess, don’t commit two sins. No shebi nobody saw you. But God saw you oh. SHUUT UP. “No ma. Nothing ma.” He looked down at his feet. “Toh! In that case.” She collected the cane and dropped it on the kitchen table. Seyi wanted to cry, for himself and for his brothers. This was it, the part where she’d tell them to present their bumbums. He had koba’d his brothers for nothing. None of them moved. It had to be a trick. Was she serious? This was new. Why was she looking at them like that? Seyi felt like he was under a microscope. “Oluwaseyi come back.” His heart stopped. She bent over at her waist till they were eye to eye and placed her hands on her knees as support. He looked into his mother’s eyes. They were searching his face. There was no fire in them again, instead they looked kind. He couldn’t do it. He couldn’t lie to her face. His heart was pounding with fear. “Mummy, please I’m sorry.” He began to weep. The rest of his apology was muffled by his crying. He watched her through rheumy eyes as she straightened to her full height and adjusted her wrapper. “Ha, so you were…” one of his brothers had started to say but was silenced by one glance from their mother. “Why did you lie? Why did you have to wake up to steal?” Her tone was a mixture of concern and disappointment. “The rest of you, no more sleep. Go and do your morning duties.” She turned to his brothers who were standing in a corner of the kitchen. 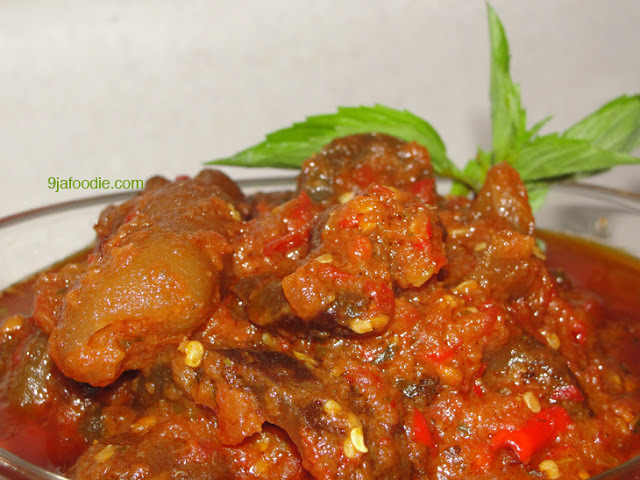 Ponmo Alata – An local yoruba cuisine of cooked peppered cow hide. I hope you enjoyed it? Please let me know if you did by expressing yourself the comment section. If you didn’t, do send all your accusations, allegations and aspersions to the comment section. Please pardon my grammatical errors, feel free to kindly point them out. Let me give a quick shout out to my Mama, Mrs Oj! (No, this post wasn’t about her) You are the best Ma, You are just too wonderful. I hope to continue to always put a smile on your beautiful face. So help me God. Amen. To all MOTHERS out there, we appreciate you. While I’m still in this mushy mood, thank you readers for your time. Oya, why don’t you like my Facebook page and follow the blog . You are too musssh. Take high five! Hello guys! How’s our weekend going? Today’s story was inspired by childhood memories, all characters are fictional by the way, before some of you start jumping to conclusions. Lemme even take a quick poll, if you’ve ever stolen a piece of meat from your mother’s pot, do like this O/ (i.e. raise your hand). My Oh My…look at you all. Well, no time for long intros. See you on the flip side. He dreaded being awake in the middle of the night. Night-time was when the witches, ojujus and all things that go bump at night came out to play. ‘He should be sleeping’, he told himself, not lying down in the pitch-black darkness, hyper-alert, thinking of the mission that had preoccupied his mind all evening. Maybe that was what kept him awake. That, coupled with the sweltering heat that had made his body sticky with sweat. Seyi, oya close your eyes and sleep, he whispered to himself. He squeezed his eyes shut. Something scurried across the room. He sprang to a sitting position. Eyes wide as saucers, he scanned the room; it was useless he couldn’t see anything even with the moonlight filtering in through the lone window in the room. He waited for his eyes to adjust to the darkness. His younger brother, Shogo, with whom he shared a bed rolled towards him and threw a leg over Semilore’s legs. He kicked it away and hissed. Shogo grunted and continued sleeping unperturbed. His two elder brothers were on the other bed in the room competing for who could snore the loudest. Sleep, obviously, was playing hide and seek only with him tonight. He lay back down, willing sleep to come. Why don’t you do it now? The voice inside his head came alive. His eyes opened. No oh. It’s not good. It’s too dark sef, are you not afraid? Another voice said. He remembered the kerosene lantern his mother usually kept lit overnight on the corridor. Ten years old and you are still afraid. My fren, chop liver and do this thing. Nobody would see you. He stood up very slowly and headed towards the door of the room. The lantern was at the other end of the corridor; just at the entrance of the kitchen. The illumination from it was just sufficient for him. He first crossed over to his parent’s room and pressed his ear to the door. No discernable sounds. He tiptoed towards the light. He picked up the lantern and entered the kitchen. He was really doing this. Anticipation chased most of his fear away. He turned up the knob on the lantern so he could see well. He didn’t want to risk hitting any pots or plates. One gbaga-ragaun and his mother would be in that kitchen faster than The Flash. He took an empty pot, carefully placed the cover on the ground and set it aside. In case he heard anyone coming, he would quickly pull down his pyjamas and start urinating in the pot in an attempt to act like he had sleepwalked into the kitchen and mistaken it for the toilet. He couldn’t help but smile at his ingenuity. He sighted the pot he came for. With trembling fingers, he carefully lifted the lid. Behold his weakness; his pot of “red pottage”. A pot of thick spicy Ponmo, well-seasoned, boiled in its juices to a chewable consistency and marinated in fried peppery sauce. He dipped his hand into the pot and picked up a soft, succulent piece of ponmo that had also had a little piece of beef. He licked off the oil that dripped down his fingers. He bit into the ponmo and tore off the beef, sucking out the juices before chewing, all the while his ears scanning for sounds to suggest if anyone was coming. He bit off a piece of ponmo and chewed it to a gummy consistency before swallowing. He licked his fingers quickly, taking in small sips of air to quench the fire on his tongue. He briefly contemplated taking another piece but decided against it. His mother might notice. In fact, this was the first time he would take a whole piece. He usually cut off small bits from several pieces of meat. He had taken a huge risk. His mother was renowned for noticing when things went missing especially from her pot or purse. However, he had visited her pot three times this week and he hadn’t been caught. He wasn’t careless like his brothers. He left everything exactly as he met it and rinsed his hands in the sink. As he picked up the lantern, he noticed a small red stain on the cover of the pot. Had it been there before? He wasn’t taking chances. He wiped it off with a rag, placed the lantern back at the entrance of the kitchen and tiptoed back to bed. “Seeeeuuun! Segggguuunn! Seeeeyiii! Shoooogo! ”. The four boys were rudely yanked from dreamland by the sound of their mother’s loud voice as it reverberated throughout the whole of No. 33 Adefila Street. Seun’s eyes lazily drifted to the wall clock. 6:24Am. Haba! Today was Saturday, the only day of the week they were allowed to be in bed till 8:00am. He looked at his brothers they wer no longer asleep, neither were they fully awake. They were waiting for somebody to get up first. “Ooooh God! This woman should allow somebody to sleep now,” Seun grumbled under his breath. All four boys scampered to the kitchen. There they found their mother scowling; her hair bound in a black hairnet; a green “Mama-is-60” wrapper around her chest. Just kidding. Click here for the rest of the story. Hi guys! How have you all been? Wondering where I’ve been? Well, I did announce that I was going on a sabbatical of some sort, though I might have extended it a little. Pardon me. Before we dive in, we all know that Nigeria (my beloved country) has been under the negative spotlight lately, ( thanks to the terrorist sect that is Boko Haram) with the two Nyanya bombings, the senseless abduction of the over 200 chibok girls and the lackadaisical attitude of our government to these pressing matters. Thank Goodness for the intervention of the International community, I’m sincerely hopeful that the girls would be brought back home soon and that the scourge that is Boko Haram (plus their cohorts) be forever purged from Nigeria. I am not here to blog about the chibok girls today. I just want to remind you to do whatever you can, whatever is in your power, to help in bringing them back. Thank you and God bless. Well, today, I’d be resuming with a guest post, written by a dear friend of mine, tush curry bobo of life, Edward Adugba. He has a very interesting mind, ever the thinker. Enjoy. He threw himself at me and wept with a loud voice, “Aboje, you won’t understand.” I had to comfort a brother I had always looked up to. For the first time, I was speechless for I had never seen him cry before. He was the epitome of great strength and courage. I knew Eche had to be hurting seriously, more than words could describe. Sam was leaning against the back of a pickup truck, his eyes deeply erythematous and filled with tears. “Aboje, I’ll miss mama. Kai! Mama tried for all of us.” Peter was sitting on the ground, completely oblivious of the full weight of the African sun, too broken to speak. I was speechless, unable to fully comprehend what Mama meant to them. I had always been far from home, away among strange men, pursuing a dream. Home was becoming a faint memory to me.I’d missed the sounds of the crickets’ chorus reaching a crescendo at dusk, just before the start of the rains; the experience of farm work; the company of aunts and uncles, full of kindness; the taste of the fish studded soups; and yes, the compassionate voice of Mama. I didn’t stand aloof. I was just distant. I cried at mama’s burial. Not just because of her loss, but because I felt disjointed. I couldn’t connect emotionally with them. I felt like fish pulled out of water. Like a bird with clipped wings, denied of the right to the skies. Disjointed. I couldn’t possibly understand the grief of Eche, Peter and Sam. Just like I can’t understand the grief of a cast away who loses an only friend, the only voice of reason lost forever. It seemed a bright light of hope suddenly went dim to a people unprepared. Eche had the right to be angrier than most of us. He seemed the most saddened and broken and I couldn’t possibly understand why. How does a frail old illiterate woman do so much when she has so little? How do “insignificant” people do great things in the lives of “significant” people? What brings giants to their knees? Money, it seems is the answer to many things. It gathers kings to a table. It leads us to a stage upon which a bright spot light is shined on us. It gathers strange people to us. However, I have found that love, long suffering, patience, wisdom and kindness often heals the injury that results from the constant contention that characterises our world. These were the things mama had. These might have been why Eche cried. Rejection is a curse. To be insignificant, cast away, left behind, every man dreads these. Mama loved what was insignificant. She valued what was cast away. She valued those things that were unknown. These she did even though she attended no school. It’s time to slow down and learn from the “insignificant rats”, from that dirty old woman who lives past the street or the lunatic who stares blankly at a world that doesn’t accept him. Through them, God can whisper something to us about what it really means to live. We live in a very fast paced world. Indeed, sometimes we have to consciously slow it down and really pay attention, appreciate the small things, reach out to the people around us. Enjoy your week!